​A rugby player is put up in a juvenile detention center. There he plays for the Highland Rugby team and ultimately plays against his father in the National Championships. You will find some amazing players near the bottom of this page! 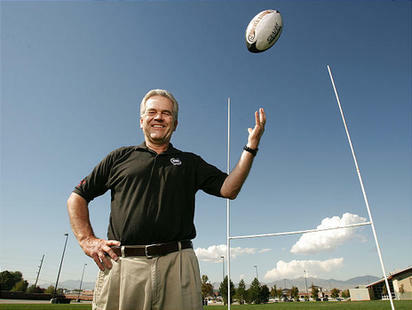 Larry Gelwix (born July 25, 1950 in Oakland, California) has been the coach of the Highland Rugby team since its founding in Salt Lake City in 1976. The movie Forever Strong (2008) was inspired by him and his team's history. The Highland rugby team has compiled an unrivaled winning record since its founding in 1973. Highland Rugby's 35-year varsity record (1976–2012) is 419 wins and 10 losses, including 19 USA Rugby national championships in the 26 years USA Rugby has sponsored a national championship. In 1998, Highland represented the United States at the World Schools Rugby Championship in Zimbabwe, Africa, which brought together the individual country high school national champions and top teams from around the world. Highland represented the USA. Highland came home with a bronze medal and a third place world finish. Gelwix is known to be very demanding on the athletes, requiring all players to adhere to a non-negotiable honor code that includes, among other things, avoiding alcohol, tobacco and drugs. Gelwix formulated what he called the "5 Championship Strategies for Sustainable Success." These success principles focus on Horizontal Leadership; staying away from things you know are wrong; attitude and effort, W.I.N. – What's Important Now – which encourages his players to make decisions now that support what they want in the future, or "tomorrow"; and to focus on the final score of life. Gelwix encourages his players to be true to the beliefs of their own individual faith. Gelwix is a native of California. He was born in Oakland, CA and raised in the San Francisco Bay Area. Gelwix graduated from Del Valle High School in Walnut Creek, CA. After attending one year at BYU, he served as a missionary for The Church of Jesus Christ of Latter-day Saints (LDS Church) in the Central States Mission. He earned a BA and MA fromBrigham Young University (BYU) in Organizational Communication. He also played rugby for three years at BYU under coaches from New Zealand. He became an instructor at an LDS Church seminary adjacent to Highland High School to earn money to pursue a doctorate at Purdue University. He became an assistant football coach during the fall season and a wrestling coach in the winter. He missed coaching in the spring, and having played rugby at BYU, decided to start a rugby team at the high school. Gelwix left teaching seminary full-time after four years and pursued a career in the travel industry. Through a series of mergers and acquisitions, Gelwix became a co-owner of Morris Travel, which operated travel agencies throughout the western United States. Gelwix and his partners sold Morris Travel in 1995, at which time Morris had 50+ offices and over 400 employees. Following the sale of Morris Travel, Gelwix was hired as CEO of WinAir Airlines, a charter airline operating nine 737 aircraft. In 2000, Gelwix and former business partner, Mark Faldmo, formed Columbus Travel, headquartered in Bountiful, Utah. Columbus Travel has become one of the largest and most successful travel agencies in Utah and won the "Best of State" award three times as the "best travel agency in the state of Utah" and was named by Mark Travel Corporation (one of the largest tour operators in the world) as one of the "Top 10 Travel Agencies" in the country. Columbus has been awarded numerous other honors, distinctions, and citations in the travel industry. Gelwix is best known in the Rocky Mountain area as the "Getaway Guru" and host of the syndicated "Travel Show" radio broadcast. Gelwix has been an on-air radio talk show host for more than 20 years (12 years at KSL and 8 years syndicated by Clear Channel Communications). Gelwix is also the feature on the "Getaway Guru" segment broadcast weekly on KUTV channel 2, the CBS network affiliate in UT, ID, and western WY. Gelwix serves as CEO of Columbus Travel. Gelwix has received many awards, honors, and distinctions, including the "Best of State" award as the best high school coach in the state of Utah, the "Education Service Award" from the State of Utah Department of Corrections; and the BYU "Outstanding Service" Award. "You have two years to serve the Lord, and the rest of your life to think about it." "Good decisions don't make life easy, but they do make it easier." "The true test of a man is what he will do when no one will know." "The essence of a lie is not the words you choose, but the message you convey." "If you lose your integrity, you've lost everything." "I want you to be forever strong on the field, so that you will be forever strong off the field." "I don't build championship teams, I build championship boys." "Practice doesn't make perfect, practice makes permanent." (among Polynesian Hawaiians) a term used to refer to a non-Polynesian, especially a white person. (among Hawaiians) a term formerly used to refer to any foreigner. Larry Gelwix, the former LDS seminary teacher and unofficial Man of the Hour in Salt Lake City, says he is enjoying his brush with fame, and so it would seem. He dipped into his savings to take his family to New York for the premiere of "Forever Strong," the movie about Gelwix and his Highland High rugby team. He attended another premiere in Los Angeles and still another one in Utah. He has been interviewed by radio, TV, newspaper and magazine reporters from Texas, California, England, New Zealand, Argentina, New York and Chicago. When a local reporter called the other day, he was making the rounds of Salt Lake TV stations and had to check with a PR man to find an opening in his schedule. "We're having a lot of fun with this," said Gelwix, whose cell phone vibrates every few minutes during a two-hour interview. Gelwix is the real-life coach who is portrayed in "Forever Strong" by veteran actor Gary Cole. In his day job, Gelwix owns a travel agency. In his evening job, he coaches high school kids. For 33 of his 58 years, Gelwix has coached Highland's powerhouse rugby team. It's probably inevitable that rugby, one of the world's most popular sports but no more than an afterthought in America, would have its turn for a movie treatment, since every sport from horse racing to cheerleading has already been featured. Gelwix joins Don Haskins ("Glory Road"), Herman Boone ("Remember the Titans") and Jack Lengvel ("We Are Marshall") as coaches whose stories are told on the silver screen. The answer to your next question: "I am thrilled with the movie," said Gelwix. The project began nearly three years ago when screenwriter Dave Pliler and producer Brad Pelo became so smitten by rugby while filming a movie in New Zealand that they decided it would be the subject of their next movie. Despite rugby's status in America as football's ugly stepbrother, Pliler and Pelo wanted to tell an American story. After consulting rugby aficionados and searching the Internet, they noticed that the Highland club was the one name that surfaced repeatedly. Why wouldn't it? In the past 24 years, Highland has won the national championship 18 times, finished second five times and third once. The team is so good that when they finish second, Gelwix is asked, "What happened?" Its won-loss record is a mind-boggling 379-9 against high school-aged competition. It is 48-17 against college teams. Pliler and Pelo called Gelwix and requested a 15-minute interview at his travel agency in Bountiful. It turned into three and a half hours. "That was the genesis of 'Forever Strong,"' said Gelwix. At that point, they didn't know what story the movie would tell. Once a week for nearly two months, they convened groups of current and former Highland players in Gelwix's Salt Lake home and, with cameras running, simply told them, "Tell us stories." The movie is a collection of stories gleaned from those interviews, woven into one season. All of the characters are based on real players, although some are composites of several players wrapped into one player. To capture Gelwix on the big screen, they put a microphone and camera on him during practices and games. Cole also spent time with the coach. "I was thrilled with the way Gary Cole portrayed me," Gelwix said. "Many of my players and their parents say he captured my mannerisms. Most of the things he says in the movie are things I say all the time." In the basement of his Salt Lake home, Gelwix has a trophy case the size of a walk-in closet that is packed floor to ceiling with trophies and medals from three decades of rugby victories. "Less than half of the trophies are here," he says. "We ran out of room. The rest are in boxes." He picks up a medal and rubs it between a thumb and finger. "There are stories behind each award. I remember the kids from each team." Some of those kids are now in their 50s, and Gelwix is coaching their sons. Gelwix, an outgoing man with glasses and a thatch of graying hair, was raised in California, served a mission in the Midwest for The Church of Jesus Christ of Latter-day Saints and earned bachelor's and master's degrees at Brigham Young University in organizational communications. He became a seminary teacher at Highland High to earn money to pursue a doctorate at Purdue, but his plans quickly changed. "I absolutely loved teaching," he said. "It was never work. It was the greatest thing I ever did. I could influence young people for good." He was an assistant football coach in the fall and a wrestling coach in the winter. He missed coaching in the spring, so he decided to start a rugby team, which doubled as the perfect off-season training program for football. Gelwix, a former high school wrestler and football player, had been introduced to rugby at BYU. Some of his friends played on the school's club team and encouraged him to try out. He played at BYU for three years. "In those days, if you were living and breathing you could make the team," he said. He put up posters in Highland High advertising the start of a rugby team. Six kids showed up for the first practice. "Only one of them had athletic ability," says Gelwix. He recruited enough football players and wrestlers to field a team of 25 players. It wasn't until 1986 that there was an official national championship tournament, and that year Highland won the first of its 18 titles. "The rest is history," the coach said with a smile. Gelwix said he quit his teaching job after four years and entered the travel business in 1979 because, "I had to pay my bills." He eventually became a founder and principal owner of Morris Travel, which he and his partners sold in 1995. He and partner Mark Falmo started Columbus Travel in 2001. Gelwix has done a weekly radio travel show under the nickname of the "Travel Guru," first on KSL for 12 years and now on KNRS for five years running. He also does a three-minute segment on Wednesday mornings on KUTV. Gelwix, who has five children with his wife, Cathy, reluctantly gave up teaching in the classroom to survive financially, but he still teaches on the field. He believes that what sets Highland Rugby apart from other teams is its overriding philosophy. "It's not about rugby," he says. "It's about helping young men grow up with their feet on the ground and hopefully avoiding a lot of the junk of life. Rugby is just a vehicle. It's infinitely easier to turn out championship teams than championship boys." Gelwix has one primary rule: Don't do anything that would embarrass you, your family or the team. "Everything is covered by that," he said. More specifically, alcohol and drugs are forbidden. Lying or dishonesty of any sort is the gravest sin on the team and results in suspension. Before the start of each season, Gelwix requires the boys and their parents to sign a code of conduct. He also requires parents to talk to their children about team rules. "I've had wonderful feedback from parents and kids about that," he says. "I've had fathers tell me they had never felt comfortable talking with their kids about matters of life or about moral values or behavior, and that this opened up a whole new relationship between them and their sons. I can't guarantee that these kids will always make the right decisions, but I can guarantee they will know the difference between right and wrong." He suspended a team captain once for cheating in school. "That was hard," he says. "We don't do it in a vengeful way. We give them extra attention and let them know we care about them and want them back. It's not a punishment; it's a consequence." Once a week, following the most rigorous workout ("they listen better when they're tired") Gelwix sits his players on the grass and talks about values for 15 minutes. Sometimes that includes role playing in matters of drugs, honesty, etc. Gelwix has many favorite sayings and mottoes — "Gelwixisms," the players call them. The name of the movie is one of them — "kia kaha," which in the Maori language means "forever strong." The longer version: "Be forever strong on the field, so that you will be forever strong off the field." Others: "Practice doesn't make perfect, practice makes permanent." "It doesn't matter who scores, it only matters that we score." "No regrets." "Good decisions don't make life easy, but they do make it easier." "If you lose your honor and integrity, you've lost everything." "Attitude and effort are everything." "If I can't trust you off the field, how can I trust you on the field?" Gelwix never cuts players, reasoning that if they are willing to work hard they deserve to be on the team. It means he must field five teams — two varsity teams, one junior varsity team and ninth- and eighth-grade teams. He eschews the traditional, negative, in-your-face coaching style. He often takes players to lunch, individually or in small groups, to discuss their lives. "The conversation is not about rugby," he says. "It's about how they're doing in school and at home." Former Highland player Bob Nilsen, former president of Burger King and now co-owner of Cafe Rio restaurants, was once asked at a business gathering in Hong Kong to name the teacher who had most impacted his life. He named Gelwix. "This is the real stuff, and it's hard to communicate in a movie without it being corny, even though the movie is well-done," he said. "Coach Gelwix was our friend, and he loved us. He's impacted the lives of thousands of kids. My son plays for him, and the change I have seen in him has been nothing short of extraordinary." "Coach Gelwix was very much a mentor," said Morgan Scalley, another former Highland player who went on to star in football for the University of Utah, where he is now an assistant coach. "He had the players take ownership of the team on and off the field — players would hold players accountable. The younger kids came in watching how the team leaders acted and how they did things the right way and it set the tone for them." Certainly, Gelwix is reading these recollections and enjoying them immensely. He prizes the boxes of letters and e-mails he has collected from former players that express similarly fond sentiments about their Highland experience. Years ago he decided "there's a better way to coach." He seems to have found it.